Today two female students came into my office and asked, in perfect unison： "Mori-mori Sensei, in another class we're learning about J Lacan's theory of the three modes/structures of the psyche--the Imaginary, the Symbolic, and the Real--but it doesn't make any sense; can you explain it to us using simple terms and a specific example?" I responded： "Well girls, take, for instance, the story we read this week, Akutagawa's 'Negi' (1919). The character Tanaka exists in three modes in the text. Let us call these three modes Tanaka 1 (The Imaginary), Tanaka 2 (The Symbolic), and Tanaka 3 (The Real). Tanaka 1 is the Tanaka-for-Okimi: a pure creation of O-kimi's romantic imagination, constructed from an array of assorted images and sensory associations; it is this Tanaka whom O-kimi thinks she is in love with, and who makes her virginal heart flutter in anticipation of tomorrow's date. Tanaka 2 is the Tanaka-for-the-'I'-narrator. Since the narrator (a writer) clearly seems to be infatuated with O-kimi (possibly to the point of stalking her at night), Tanaka is his natural rival. As the weakest member of this love triangle, the 'I' (predictably) denounces Tanaka as a fraud, a charlatan, a glib lady-killer and false artist who uses his (relatively) privileged class status and superior learning/talents to dupe working-class women into sleeping with him; in short, he describes Tanaka in terms of social/symbolic context. Finally, Tanaka 3 is Tanaka-for-himself; this is Tanaka of "the Real." Since the story is narrated entirely from the perspective of the jealous/unrequited "I" narrator, we have no access to this Tanaka: he is beyond our understanding, defies signification. 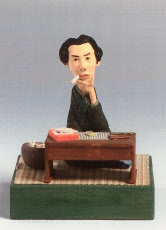 I have now explained the Lacan's three modes--the Real, the Symbolic, and the Imaginary--using the example of three modes of the character Tanaka in Akutagawa's 'Negi.' You may now leave my office." *For the official study guide to the story, click here.